"Natives of Endeavour River in a canoe, fishing." From Phillip Parker King's Survey. 1818. The Endeavour River on Cape York Peninsula in north Queensland, Australia, was named in 1770 by the English explorer, Captain James Cook. He had been forced to put his ship, HM Bark Endeavour, onto the beach at the river mouth so that it could be repaired. The ship had been damaged by coral on the Great Barrier Reef. The Aboriginal Australians, the Guugu Yimithirr people, called the river Wabalumbaal. Cook and his crew stayed for seven weeks and met with the Guugu Yimithirr. The word "kangaroo" was a Guugu Yimithirr word for the animal which Cook wrote down in his diary. The naturalists Joseph Banks and Daniel Solander made big collections of native plants and flowers, while Sydney Parkinson made pictures of the flora and fauna of the region. The Endeavour River is very wide at its mouth where it meets the sea. Upstream it quickly branches into many small creeks. There are 25 species of mangrove grwoing along the river. Saltwater crocodiles live in the river, and can often be seen on the banks during the winter in June and July. In October 2008, a man fishing for crabs on the river bank was taken by a crocodile. At first people thought it was a big crocodile, more than six metres in length. But his remains were later found inside a 4.5-metre (15 ft) crocodile. The river is also a good place to go fishing for barramundi. 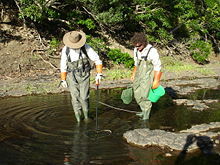 In recent years, tilapia fish, which are a "noxious species" in Australia, have moved into the river in large numbers. Scientists are worried that this will harm the numbers of native fish. These fish, which are often farmed for food in other countries, are listed in the worst 100 introduced species. A person in Australia owning or selling a tilapia could be fined up to AU$11,000. Immature Mozambique Tilapia, Oreochromis mossambicus, caught in the Endeavour River, near Cooktown, Australia. Dec. 2007. There is now a town, Cooktown, at the mouth of the Endeavour River. About 2000 people live in the town. Cooktown is the northernmost town on the east coast of Australia. It was first settled in 1873, at the site of Cook's landing. It was a port for the newly discovered Palmer River Goldfields. Some of the relatively undisturbed natural features near the mouth of the river have been protected as a Queensland National Park, the Endeavour River National Park. ↑ The Endeavour at the Endeavour: Cook's and Bank's journals from 11 June to 4 August 1770. (Undated) Compiled by John & Bev Shay. Cooktown and District Historical Society. ↑ "Endeavour River Cooktown Queensland". fishingcooktown.com. Retrieved 4 August 2010. ↑ "Monster crocodile takes camper near Cooktown". couriermail.com.au. Retrieved 4 August 2010 – via Courier Mail. ↑ "Forensics confirm veteran's bones found in crocodile - ABC News (Australian Broadcasting Corporation)". australiansonline.net.au. Retrieved 4 August 2010. ↑ 5.0 5.1 "Tilapia | NSW Department of Primary Industries". dpi.nsw.gov.au. Retrieved 14 August 2010.